I’d like to have a disk report available as a task or diagnostic task that will show what folders / files on the alerting volume are using the most amount of space. I did see the below question that was similar and have seen the folder usage script but was curious if a “ready to go” script was available already before I try to create it myself with the PowerShell MP. I made a small script that runs as a diagnostic task whenever a disk full alert is raised. It sends a e-mail report to our admin-team. $diskMessage   += "<tr><td>Total: $($SizeInGB) GB |</td><td>Free: $($FreeSpaceInGB) GB ($($PercentFree) %)</td></tr></table>"
$dirAndFilesDetails    += "<tr><td style=`"font-weight: bold; text-align:center`"><br />&nbsp;$($dirItem.Name)</td></tr>"
$dirAndNewFilesDetails += "<tr><td style=`"font-weight: bold; text-align:center`"><br />&nbsp;$($dirItem.Name)</td></tr>"
$htmlBegin   = "<!DOCTYPE html><html><head><title>DISK FULL - Troubleshooting Assistance on $($env:Computername) -  $($computerDescription)</title>"
$htmlBegin  += "<h1><span style=`"background-color:#D3D3D3`">DISK FULL - Troubleshooting Assistance on $($env:Computername)</span></h1></head>"
$htmlBegin  += "<h3><span style=`"background-color:#D3D3D3`"> $($computerDescription) </span></h3></head>"
Subject     = "DISK Full - Troubleshooting Assistance on $($env:computername) . $($computerDescription)"
$metaInfo     = "<table><tr><td>Gathering details took:</td><td>$($reqHours) Hours / $($reqMinutes) Minutes / $($reqSeconds) Seconds.</td></tr>"
$metaInfo    += "<tr><td>Checking time:</td><td>$($scanDate), $($timeZone)</td></tr>"
@Pete ,don’t worry. The script runs fast. Averagely it finishes within 30 seconds for 60 GB. Thanks Ruben, I'll check out your script. Looking forward to the step by step instructions as well! Yeah, i'd love the step by step too. I'm sure we could make use of this too. Great work. Ruben, this is awesome - thanks very much for sharing. I think the challenge is going to be finding a script which can return the data you want in a timely fashion. Anything which is called on-demand is going to take quite some time to execute as it has to traverse the entire disk and all of the subfolders. I’d probably be more inclined to go the route of using a scheduled task that runs periodically and creates such a report; you could then have an on-demand task which just pulls the data from the report. Any method is fine. A diagnostic would be ideal but having the capability within SCOM / SquaredUp is the main goal. This is very neat and very helpful. Thanks Reuben. I ended up creating three tasks. One task for looking 1 level down in a directory, one task for 2 levels down in a directory, and then a task that runs Ruben’s report. The first two tasks I just slightly modified the one that is in the SquaredUp GitHub link I posted initially. 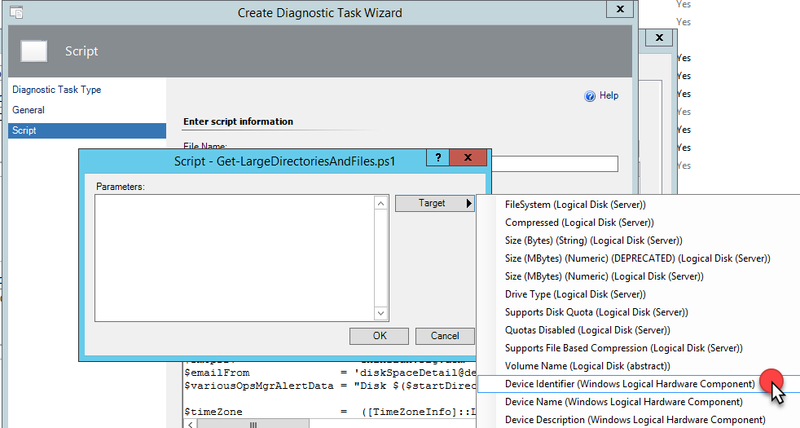 The tasks were created for 2008/2012/2016 logical disks. Write-host "No Subfolders found on that path."